NALFLEET™ Alkalinity Control™ is a concentrated liquid alkaline product for corrosion and scale control in boilers. Convenient liquid treatment which provides the basic alkalinity for optimum corrosion and scale control. Corrosive to aluminium, magnesium, zinc and tin. NALFLEET™ Alkalinity Control provides alkaline conditions in the boiler water for optimum control of corrosion and scale deposition and should be used as part of a multi-product treatment programme. For optimum results dose NALFLEET™ Alkalinity Control direct to the boiler with an automatic dosing unit, or via the bypass pot-feeder installed in the boiler feed line. A proper level of treatment is maintained by testing for p-Alkalinity. The level is determined by the pressure and type of boiler. Refer to the dosage table below for correct dose rates. 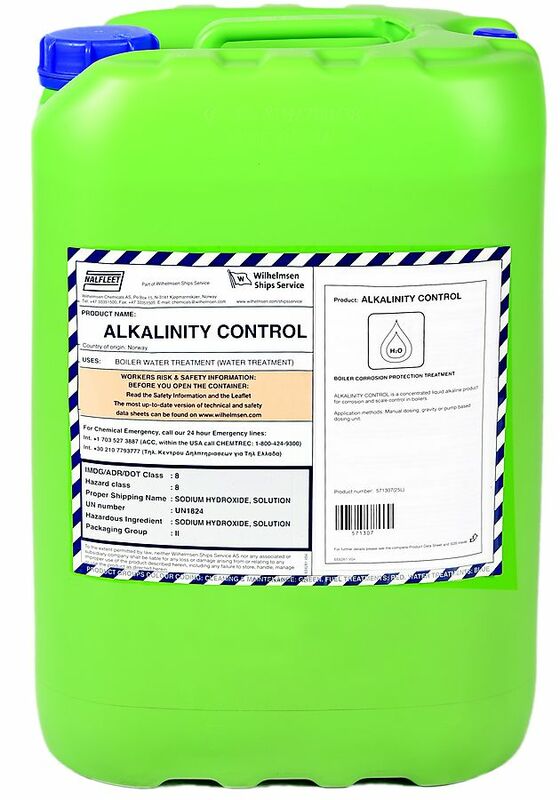 The normal method of raising the alkalinity level is by adding the required quantity of NALFLEET™ Alkalinity Control after testing for p-Alkalinity. 225 ml/ton will raise the p-Alkalinity by 100 ppm. USING THE TABLE: Select the section corresponding to the pressure of the boiler to be treated and read across the table to obtain the level of treatment required. Proper treatment should normally give a pH between 9.5 and 11. These are recommended values based on experience and are in no way intended to replace the boiler manufacturer’s specifications or company regulations. A representative sample of boiler water should be drawn for analysis daily. The sample should always be taken from the same point after blowdown, cooled and tested immediately. Follow the WSS Test Kit instructions and log the results in Waterproof. The results should be sent to WSS as stated in the Waterproof instructions. It is important that regular testing is carried out to ensure levels of treatment are correct.